Tom Baxter graduated from Strathclyde University in 1975 with a B.Sc. in Chemical Engineering (first class honours). He is a Fellow of the IChemE. He started his career with ICI Petrochemicals, moved to fine chemicals with the Swiss company Ciba-Geigy before taking a position as a Process Engineer in 1980 with BNOC (British National Oil Corporation). Through privatisation and acquisitions BNOC became Britoil then BP. Here he worked as an Operations Engineer, Development Engineer and Research Manager. In 1991 he left BP and joined Altra Consultants as Technical Manager. 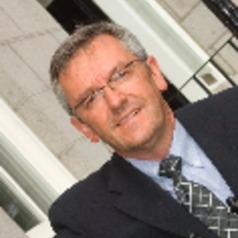 In 1998 he accepted a position as Technical Director with Genesis Oil and Gas Consultants and became the Aberdeen Business Unit Director in 2006. He returned to his role as Technical Director on 2010 together with a position as Senior Fellow in the Chemical Engineering Department at Aberdeen University which he helped establish. He was appointed Visiting Professor of Chemical Engineering at Strathclyde University in 2003 and Aberdeen in 2009. He has co-authored numerous papers on the use of Full Cost Accounting to measure sustainable performance.